It’s bitter sweet writing this last post on my kitchen remodel. 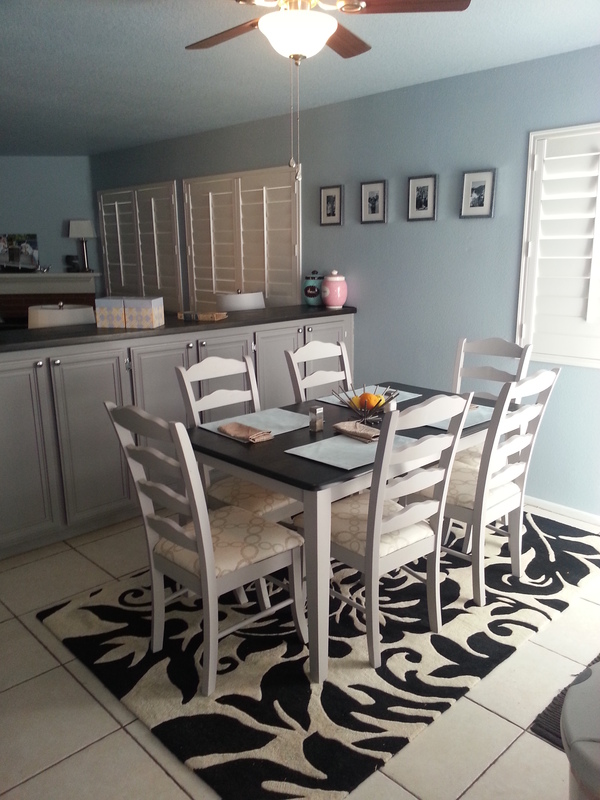 I am excited that my Temporary Dream Kitchen is complete for now and I have really enjoyed sharing my experiences and lessons learned in the process. From starting the design process, to dealing with budget constraints, triple digit heat and execution of projects; it has definitely been a ride. And I am glad you could come along with me in the process. 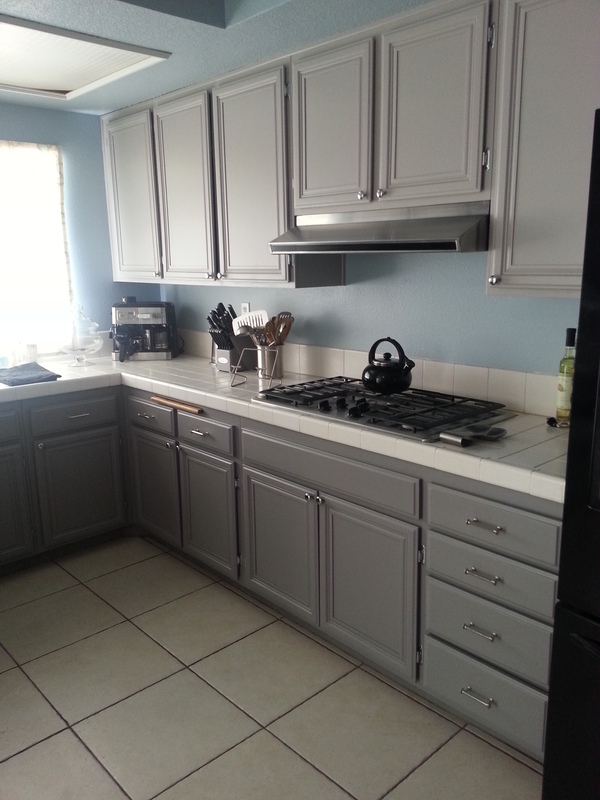 My goal for this kitchen transformation and remodel was to utilize what was already existing but transforming it into something new. 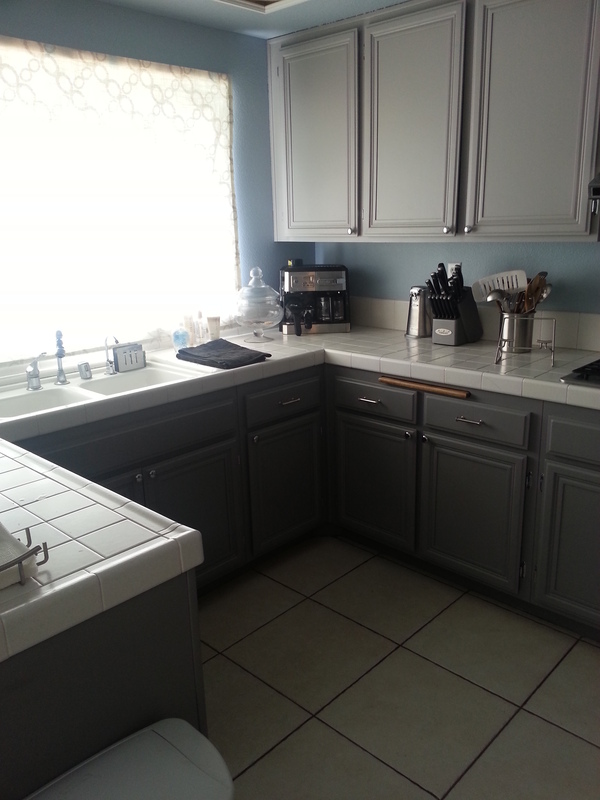 My cabinets which started as a disgusting mess to me have become (in looks anyways) one of my favorite elements with their new palette of dark gray and light gray. 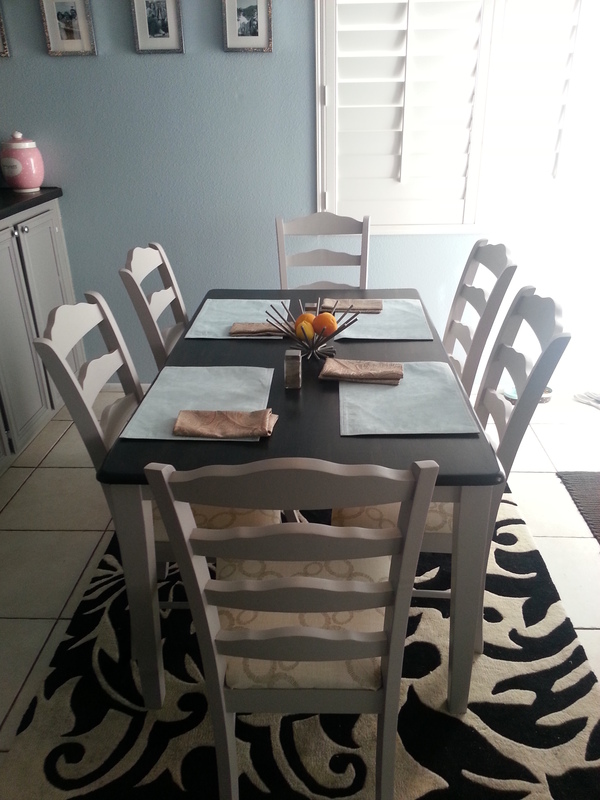 The table and chairs I hated because of their history and design have become an element that I truly enjoy and appreciate. 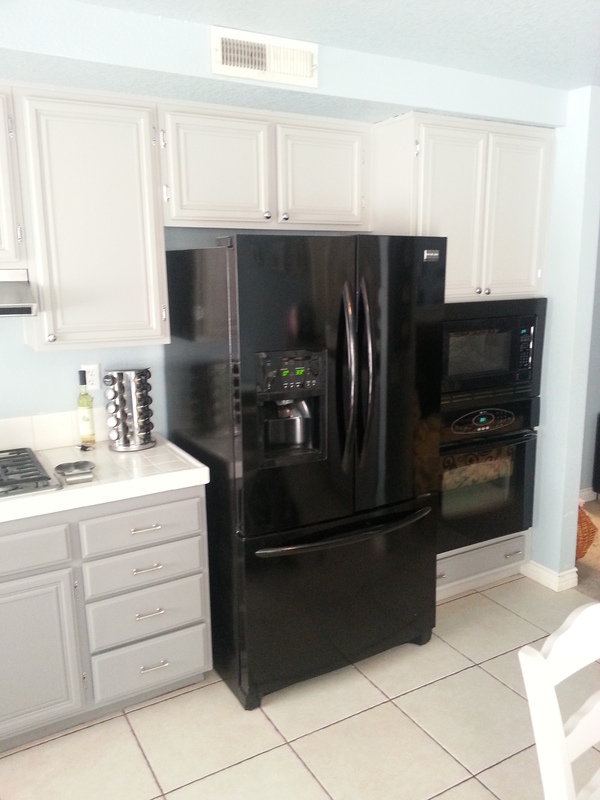 Even the black appliances that I would have rather been stainless steel feel like they belong. I also wanted to work with what we already had where I could and supplement with a few new purchases. The plate stand and plates on the bar was a prize I earned in Mary Kay but the industrial design and clean lines fit beautifully into the feel I was trying to achieve. The hammered metal frames were clearance finds that I spotted at Target years ago and new I wanted to use in my future home. And they now feature black and white family photos that I printed myself. The rugs, place setting, and dish towels were items I had already owned. Our appliances and kitchen gadgets were perfect for the stainless steel and black elements that already existed and they were gifts that I received at my bridal shower. We splurged on curtains but maximized their functionality by using them as slider cover-up curtains, a roman blind and chair cushions. 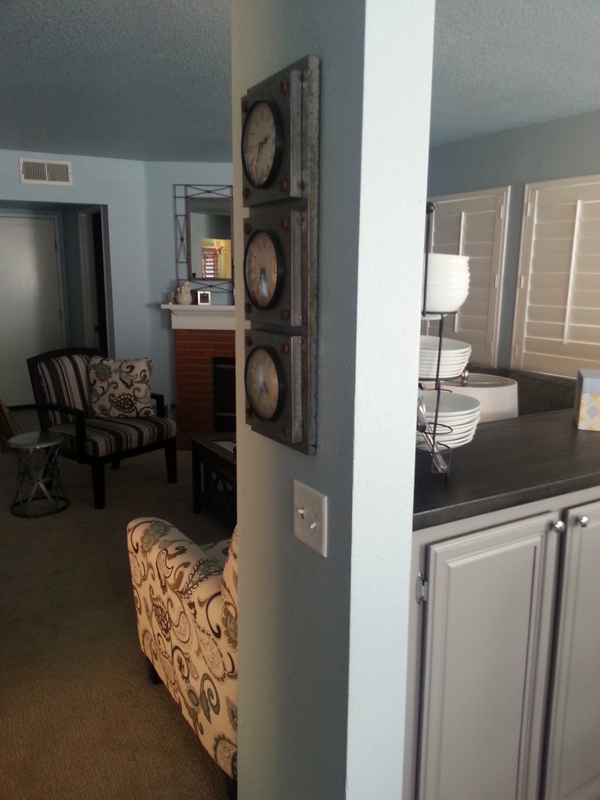 And a true splurge was the trio clock that divides and links our kitchen to our family room. It marks California time (where we are and where my husband is from), North Carolina time (where I was raised) and Grand Cayman (our favorite spot from our honeymoon) and the industrial design helps transition between the two rooms. And most importantly and a must goal was to stay on budget. Smart buys such as the ceiling fan, lighting grids and cabinet hardware helped keep the budget on point and still give the kitchen a fresh and new modern look as well as provide the pop of bling that only the jewelry of the kitchen can. Choosing to wait on items like our window repairs but masking their “ugly” elements helped keep things on track and deciding to work with existing elements like many of the major appliances and the floor tile helped offset other costly aspects of our overall design budget. In the end I think it came out quite nice. I hope it conveys an updated palette and more current feel as well as evokes a sense of welcoming and calm. I hope it is a place people want to congregate and do life with our family. 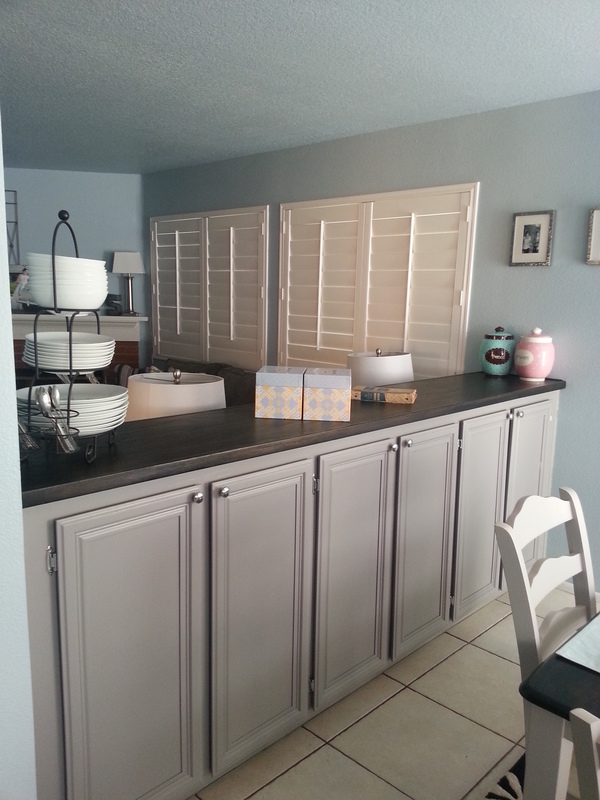 Bar that separates the kitchen from the family room – stained the top, painted the bottom, added new hardware. 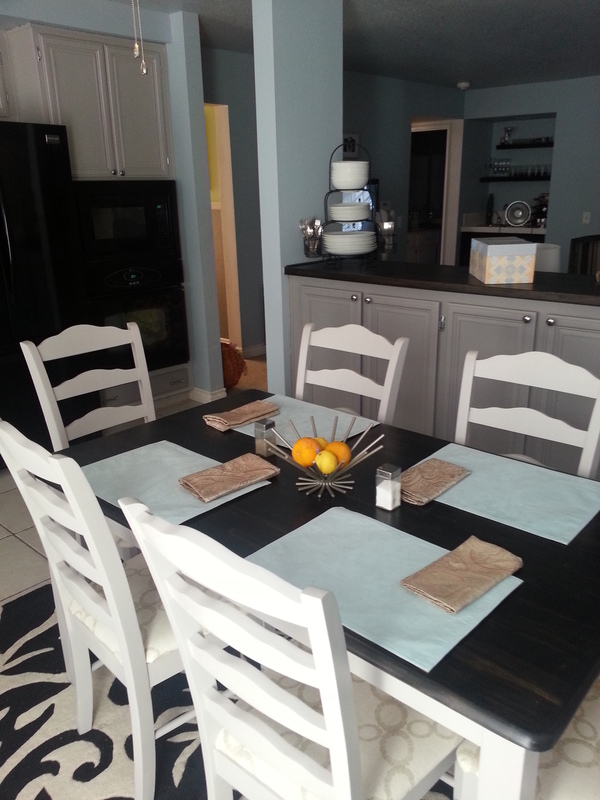 Divide Between Family Room and Kitchen – check out the really cool clock! There are still a few projects that we will tackle in the near future and I hope you will join me for those as well. We plan on re-spraying the kitchen sink to deal with some major nicks and scratches that time has left. 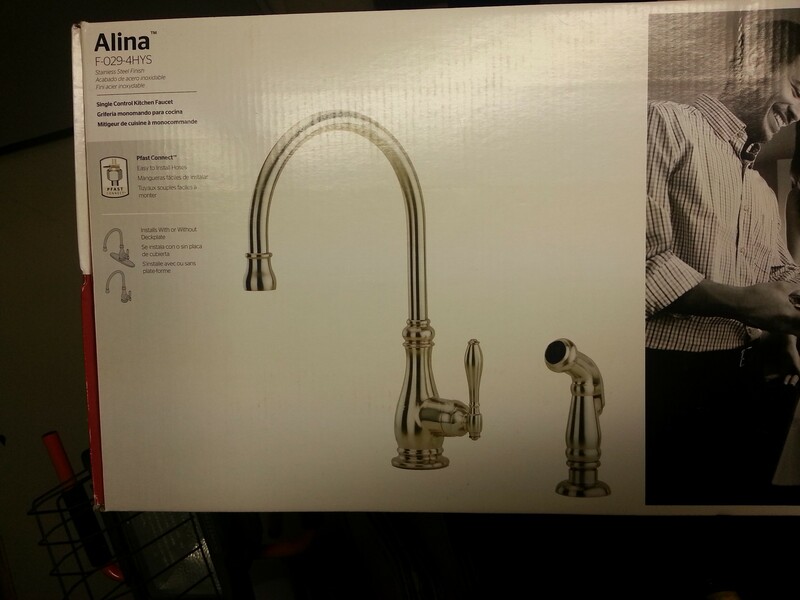 In addition to the sink getting a facelift, it will also get some new jewelry with new faucet hardware (sneak peek below). Plus we will be adding an inexpensive but cool stainless steel backsplash to the stove area and small boarder to tie it all in. 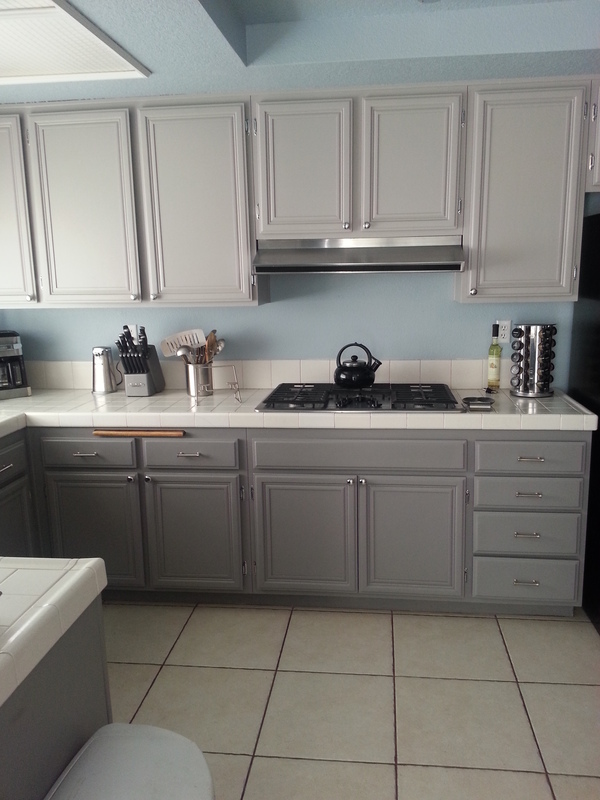 Lastly, I will be slowly organizing the kitchen cabinets to provide true functional storage. With those few last elements, my temporary dream kitchen will be complete and should be comfortable and last until we are ready for our true dream kitchen. Pingback: T.D.K. 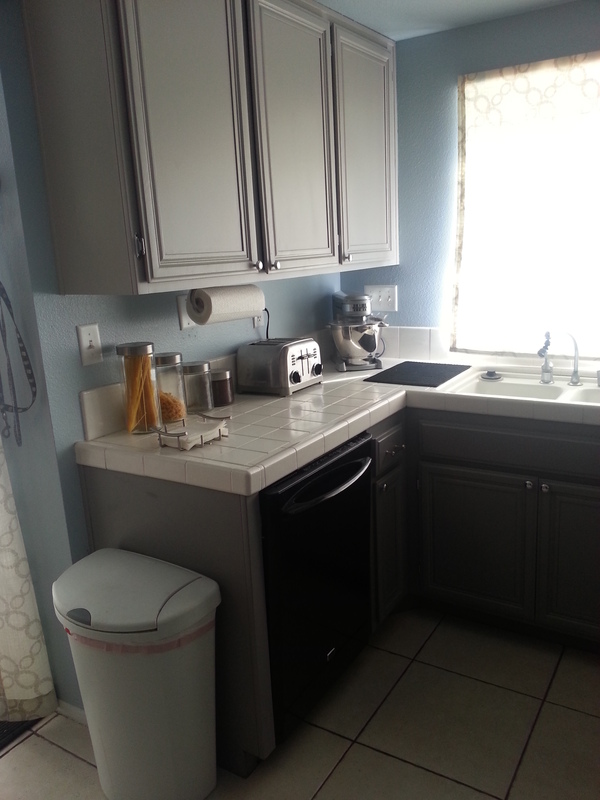 – Temporary Dream Kitchen: Finish Kitchen Remodel for Now & Future Improvements | Wife, Mom, House...Oh My!